Item shown above : Mahogany FINISH in side profile. (Flag, Certificate, Badges, Medals, Pins, Emblems are not included). 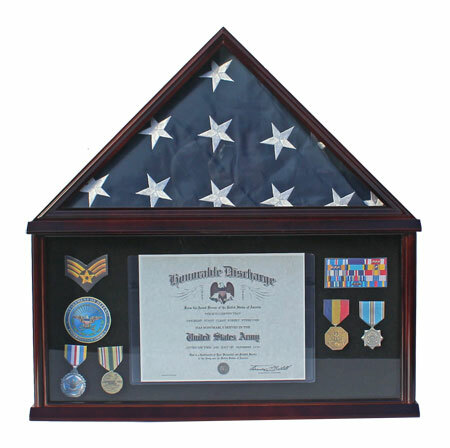 This is a super fine Flag & Medals/Pins/Ribbon Display Case that will proudly display your greatest achievements. Sanded Repeatedly for an extra smooth finish. Matted interior will keep your flag in pristine condition and not damage the material. A great way to display your military medals/ribbons and pins collections. Place your Medals, Ribbons, Patches and Pins directly into the 1/2 inch thick foam back. Wall brackets are provided for mounting the case. Also sits beautifully on any surface. Glass cover will protect your prize collectibles from dust and damage. Simply one of the best pieces you can have to display and honor your service. Can hold 5'x 8'or 5'x 9.5' Cotton or Nylon Flag. No assembly required. Interior: Triangle Area: 20.5"W X 10.25"H X 2.5"D, 2 sides is 14.5" Each. The top/triangular portion is for folded flag display and the bottom part is for certificate, ranking insignia, medals, pins, and other memorial display.